This was my first CampFI ever and I wasn’t sure what to expect. I am not a “FI” person per se however, I heard a lot about it and wanted to see what all the excitement was about. The venue for CampFI Southeast 2019 Week 2 near Gainesville, FL was great. “Miss Sarah” delivered on true Southern hospitality. The rooms were clean and comfortable and the food was wonderful. There was a lake on the property and lots of outdoorsy stuff. I was surprised to see a very mixed group of folks. Ranging from six months to sixty plus years, various nationalities and all walks of life were represented. Because I grew up in a generation where discussing one’s finances were taboo, it was startling to hear everyone talking about their net worth and retirement plans. There were folks who had reached “FI” and had already retired at amazingly young ages and folks just starting on the path to where they wanted to be. I heard no boasting. I heard tons of encouragement, support, information and lots of laughter. I’ve never found myself in a more positively charged atmosphere. It was great! I expected the weekend to be more structured than it was. While it was very well organized, I realized that Stephen just provided a framework for folks to get together in a relaxed, comfortable atmosphere. Guests could talk, visit, and exchange ideas and experiences with others sharing common goals. It was all of the guests attending that made the magic happen. The speakers were excellent and didn’t try to sell you on “their way.” They shared their stories of where they were on their path, step-by-step how they got there, and good stuff you could take away and use. It was all delivered in a clear, concise, conversational way that anyone could understand, no “geek-speak.” I walked away with much that I could apply to my own life. They were informative, inspiring and motivating. I spoke with one young woman who said she attended her first CampFI the previous year. She was following a FI path and doing okay but armed with the advice she received at CampFI, she went home and made some changes that tripled her net worth in one year. She was in a much better position to make some tough life choices. A couple who was attending their very first CampFI said they had been “meandering” along in FI for years trying to make more time for their children and family. Thanks to CampFI, they now had a clear direct path to where they wanted to be. It wasn’t just hearing about, or reading about people who had succeeded in FI for them, it was meeting them in person. 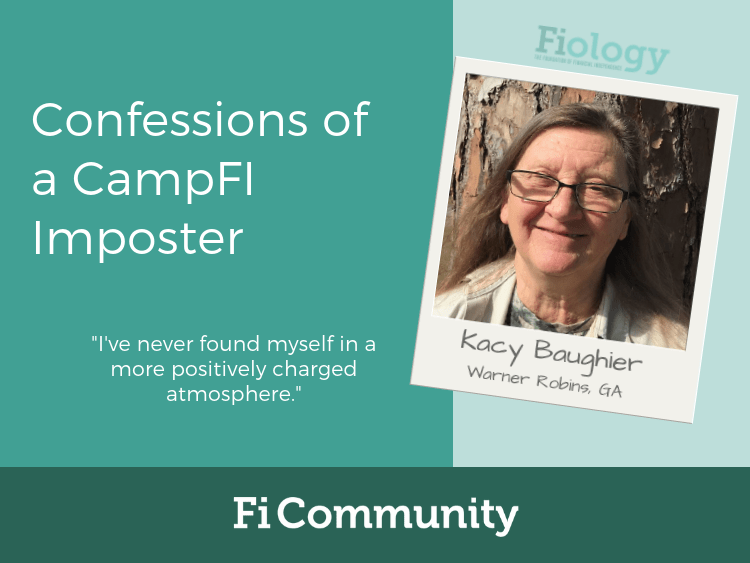 There were many more stories, but the common thread that ran through them all was that CampFI allowed guests to talk and learn with other people just like them. This was something most were not comfortable doing in their everyday life without being considered “weird”. For many, CampFI produced the “Aha!” moment where the bits and pieces suddenly fell into place. Here’s my takeaway: it’s not about money. It’s about being happy. It’s about having time with your family, enjoying travel, and pursuing your dreams, whatever they may be. It’s about how to discover your own superpowers and make them work for you. There are many paths to being happy and anyone can do it. It’s just that simple. Kacy, great takeaways! You’ve raised some amazing sons. It was great to meet you & I’m sorry I didn’t get to talk more with you. Thank you. It was a pleasure meeting you as well. I couldn’t have said it better myself! I’ve been riding the CampFI high for the past couple weeks and I can’t wait to attend another one in the future! This is awesome. I’m so glad to hear that you enjoyed your time at Camp Fi. I personally know both of your sons and I have to say, you raised an awesome duo! It was great talking to you over the week end. Great to hear you still so excited! Thank you so much, Cody. Kacy, it was so fun to meet you at Camp FI! Thanks for sharing your story. I was blown away by the community as well! While I felt like I knew some people from their blogs and interviews, Camp FI gave us time to get to know each other as real people. I’m a big believer that the more we do to break the taboo around money the better off we all are. The more we talk about it the more we can learn from each other. Well said, Lisa. I couldn’t agree more. I’m so glad you enjoyed the camp. CampFI events will truly change your life! I’m glad you got to see some of those impacts first hand, and I hope you’ll get to see them in your own life in this coming year. Good luck! If you haven’t been do go. It is a unique, exciting and just plain fun experience. Kacy, like you I was blown away by how amazing the group was at CampFI but at Southwest in CA. All ages, sharing, activities, learning, inspiring. You really nailed it on happiness. I truly believe we have to “enjoy each day.” There are so many ways we can enjoy. You totally understand that, and those who read your story will as well. Thank you. I hope to be able to attend a CampFI in the near future. Your experience definitely paints the picture of humble, helpful individuals who are all on different journeys yet have a very similar destination in mind, finding happiness. Brilliantly put!